This isn't actually my Easter mani, but I'm not near a camera to take a picture of the real thing, and this looks pretty Easter-y to me! It's actually a little preview of an upcoming series of posts I'm going to do about nail art. I also wanted to let you know that I will be responding to emails and comments as soon as possible, I've been spending time with family over the holiday and haven't been able to respond. Scrangie enjoy your time with your family. Have a Happy Easter! I love your manicure. Very cute. Thanks so much for your sweet comment on my blog. Would it be OK if I used some of your photos to accompany my posts? I love all the fun shades of nail polish you write about, and I can't wait for your nail art tutorials. Of course, I am much too clumsy to even apply a regular coat, but I will look at them longingly and fantasize about having the dexterity to pull it off. Scrangie - that's beautiful easter manicure. LOVED IT! This mani is so pretty! I have a manicure with dots to show in my blog too, but I left my camera-chord at my boyfriends house..
Scrangie, thanks for thinking of us on Easter. Cute nails! I wonder how you made the polka dots so nicely?! I love those colors together! Your dots are absolutely perfect. Looking forward to your upcoming nail art posts. What color is that pink zoya? I'm looking for neon pinks and do you have any recommendations or swatches? Have a Happy Easter yourself and enjoy all the time with your family & friends & everybody else! I can't wait for the CG Kicks swatches by the way! Lucy, thank you, same to you! Tuli, thank you, you too! Alexlyndra, ooh I can't wait to see it! I've been admiring everyone else's lately and it has me inspired! Scott, thank you! Happy Easter! Clockwork, thank you! Happy Easter! Atomica, yum! lol I wonder if I'll get special powers if I eat radioactive easter eggs? 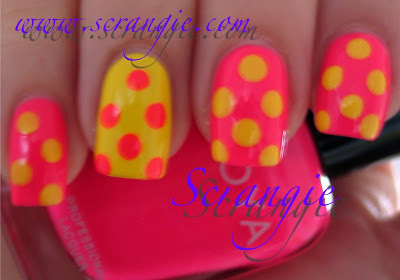 Karen, it's Zoya Ali :) Check down a few posts, I have lots of pictures of neons and I'll be posting more soon! Laure, thank you! This is my kind of pink for sure! wow, a manicure for easter? I'm doubly too lazy to even do my nails on a normal day.